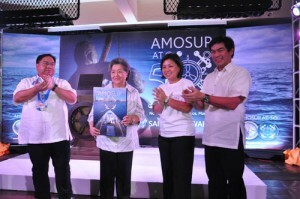 AMOSUP culminated its 50th year milestone with the launching of the book “AMOSUP, Looking Back, Sailing Forward” last Nov. 29, 2011 at the Seamen’s Center. VIPs and guests from different shipowner companies, manning agencies, maritime organizations as well as allies from the government and private sector attended the event. The book launch opened with a short tour conducted by Carlos Celdran who took guests through a visual timeline of the Union’s history. The highlight of the event’s short program was a formal handover ceremony where cadets from the Maritime Academy of Asia and the Pacific handed over a special edition of the book to the family of the late Captain Gregorio S. Oca, founder of AMOSUP-PTGWO-ITF. Copies of the book were later distributed to the guests. “AMOSUP: Looking Back, Sailing Forward” chronicles the highlights of the Union’s half-a-century of service to the Filipino seafarers. The coffee table book traces the Union’s colorful history from its humble beginnings in the 1970s to its continued growth and progress throughout the succeeding decades. 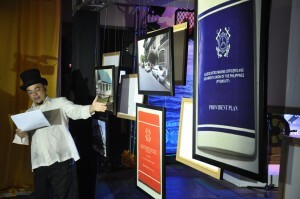 Veteran Manila guide, Carlos Celdran, regaled the crowd with his guided tour of the AMOSUP timeline, taking guests through 50 years of the Union’s history in 15 minutes. Mrs. Ditas F. Oca, wife of the late Capt. 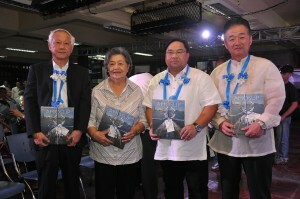 Gregorio S. Oca, receives the special edition of the AMOSUP book together with the children of the late Capt. Oca, Dr. Conrado F. Oca, Marissa F. Oca, and Miguel F. Oca. VIPs from the international maritime industry graced the book launch and shared in the momentous occasion. From left to right: Tsutomu Iizuka, Chairman of the International Mariners Management Association of Japan (IMMAJ), Mrs. Ditas F. Oca, wife of the late Capt. Gregorio S. Oca; Dr. Conrado F. Oca, President of AMOSUP-PTGWO-ITF; and Yoji Fujisawa, President of the All Japan Seamen’s Union (JSU).